* Please note this is not the final map. Changes may apply! Do you have any questions? Check the FAQ below if it´s answered there! WHAT IS WEEKEND FESTIVAL SWEDEN? Weekend Festival, that’s coming to Sweden this year, started in Finland 5 years ago. It’s the biggest EDM-festival in the Nordic regions. Previous years world famous artist like Tiësto, Armin van Buuren, Martin Garrix, Hardwell, Avicii, Afrojack, Calvin Harris, David Guetta, Showtek, W&W, Tungevaag & Raaban and many more, have given the festival visitors unforgettable days filled with music. 2015 Weekend Festival Baltic & Finland had over 160.000 attendees. Both where sold out. WHAT´S THE LINE-UP FOR WEEKEND FESTIVAL SWEDEN? WHEN ARE THE TICKETS ON SALE TO WEEKEND FESTIVAL SWEDEN? For those whom pre-registered at www.weekendsweden.com the ticket sale opens February 8th to February 14th. It´s a maximum of 6 tickets per person during presale and to discounted prices. (It´s a limited range of presale tickets that goes out during February 8th – 14th) The official ticket sale starts February 15th. IF I PRE-REGISTER AT WWW.WEEKENDSWEDEN.COM, AM I OBLIGATED TO BUY TICKETS THEN? No, you just enhance your chances and possibility to buy tickets before everybody else and to a better price. WHAT´S THE PRICE FOR THE TICKETS TO WEEKEND FESTIVAL SWEDEN? – Please visit our ticket page for price information. FOR HOW MANY DAYS IS WEEKEND FESTIVAL SWEDEN ONGOING? – Weekend Festival Sweden is a two-day festival during 5-6th of August. WHERE WILL WEEKEND FESTIVAL SWEDEN BE LOCATED? – Weekend Festival Sweden will be arranged at the venue Östermalms IP in Stockholm, that´s in walking distance from the city center. It´s easy to get there by public transportations both by bus and subway. Its walking distance from Stureplan which is just approximately 2km away. Nearest subway station is Stadion, that´s on the redline to Mörby Centrum, entrance Valhallavägen. HOW WILL THE FESTIVAL AREA LOOK LIKE? – There will be several stages on the festival area. A map over the venue will be presented closer to the Festival date. IM I ALLOWED TO TAKE PHOTOS DURING WEEKEND FESTIVAL SWEDEN? – You’re allowed to use your mobile camera and a regular camera, due to security reasons selfiesticks won´t be allowed´. Please tag your photos with #wknd16 and #wkndsweden. Professional cameras are not allowed without permission from Weekend Festival Sweden. I AM A PRESS PHOTOGRAPHER AND WANT TO WORK DURING WEEKEND FESTIVAL SWEDEN, WHO DO I CONTACT? WILL THERE BE SPECIAL OFFERS/ PACKAGES FOR COMPANIES OR BIGGER GROUPS TO BUY? – For business inquires we ask you to contact us at corporate@weekendsweden.com. All other information about the different festival tickets please visit our ticket page. WILL THERE BE FOOD AND BEVERAGES AT WEEKEND FESTIVAL SWEDEN? – Yes, there will be different types of food and beverages served during the festival. Liquor will only be served at the premium and VIP-area. In the general area cider, wine and beer will be served with a 18 + age limit. CAN I BRING MY OWN BEVERAGES TO THE FESTIVAL? – No, that’s not permitted. HOW CAN I FIND OTHER FESTIVAL ATTENDEES? – You can find other Weekenders on our Facebook page www.facebook.com/weekendsweden and on our Instagram @weekendsweden. – Yes, it´s 15+ to the festival, 18+ to the premium areas and 20+ to the VIP-area. You need to be 15y, 18y and 20y old at date to enter the different areas. More information about the tickets will be release February 15th. DO I NEED TO HAVE AN ID? – Yes, everybody needs to bring their ID, with photo and birth number on. How is the accessibility for me who are in a permobil or wheelchair? – We will have an elevated area in front of the large stage on the Standard and Premium area. Escorts attend the festival for free. Due to safety reasons we urge all visitors that are handicapped to send an email to access@weekendsweden.com before buying tickets. Dress based on the weather! If it´s hot, drink lots of water. Besides that, just bring your smile and be prepared for loads of dancing and love!  Information will be updated regularly! We have two different entrances. Several lines are made for people with Standard ticket where we have a special “express” line for disabled people and people with no carry-on and/ or bags. Premium and VIP ticket holders have a separate entrance. If assistance is required at the entrance, please alert the nearest festival staff member. We will have an elevated area in front of the large stage on the Standard and Premium area. Escorts attend the festival for free. All tickets will be changed to wrist bands in the entrance to the festival site. Each ticket category has it’s own entrance. Standard ticket owners can not leave and re-enter the festival site on the same day and need to take their tickets with them when entering on both festival days. The ground of Östermalms IP consists of concrete, plastic grass and natural grass. We suggest people to wear good shoes, because most of the infield is relatively flat and hard. In the case of rain, please wear rain boots. Festival will take place rain or shine. Wear suitable clothes depending on the day’s weather. By purchasing a ticket to festival, you agree to submit to a thorough body search, including emptying your bags and pockets and having all your items examined. We reserve the right to refuse entry to anyone who refuses to co-operate. You must be 15+ to enter and 18+ to buy alcohol. Photo ID (or drivers-license, passport) required when buying alcohol in the definite dispensing areas. Nobody will be allowed entrance to the festival without a valid ID. We have a zero-tolerance policy for drug use and possession. Police officers will be working inside and outside of the festival area during the whole festival. All narcotics laws will be strictly enforced. Be responsible, and make smart choices. NO refunds or exchanges for any of the tickets. Weekend Festival reserves the rights to change the festival lineup and timing. No refund will be granted if a change is made. + Good vibes, big smiles and unique outfits are always appreciated! You can bring your own hand-made banners and country flags with you. Please note and be reasonable while designing: Flags and banners are ok as long as they don’t disturb others. We want to make your festival experience as memorable as possible! Big smiles and good vibes are always something we want to achieve! Check out our festival map for locations, festival map will be put online closer to the festival date. Cloakrooms and lockers are available for you for an extra fee, where you can leave your jackets, bags and extra items. Run, dance and jump free without heavy carry-ons! Don’t risk losing track of your friends or missing the perfect photo! Keep your phone powered up at our battery charging station. 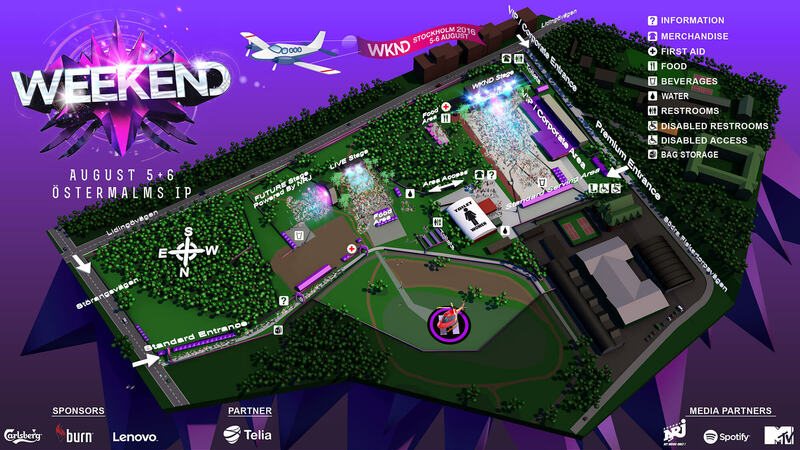 Weekend Festival merch booths can be found on the area map and will have a variety of T-shirts, sunglasses, bags, sweatshirts, official water bottles and more epic stuff! We offer you the wildest amusement rides and craziest activities from bungee jumping to ferris wheel. Spin your head ready for dance floor! Food and beverage stands are located throughout the festival area, with serving water, snacks, and other beverages. All the common credit and debit cards are accepted and preferable. Limited cash points will be available. You can buy beer, wine and cider from the definite dispensing area throughout the festival. You must be 18+ to be allowed to enter this area (ID required). In the Premium area you can buy beer, cider and wine throughout the day and liquor will be served after 20.00. The VIP-area will serve beer, cider, wine & liquor from 14.00. Weekend Festival recommends all attendees to drink responsible. Let’s fight for a cleaner planet and better vibes! We hope that everyone takes recycling as their concern while arriving, being and leaving the festival area. Think about our environment. All public restroom areas are accessible to our customers and patrons with disabilities. Please see your festival map for locations, or contact the nearest staff member for assistance. We also provide “Luxury Toilets” for a small fee if portable toilets are not for you! Priority and VIP areas have their own flushable toilets in their own definite areas. One of the info booths is located right next to the entry gate. Please see your festival map for locations, or contact the nearest staff member for assistance. We want to achieve a safe surrounding for everyone and first aid teams are patrolling around the area during the festival. If you need any counseling, please go to the nearest medical or information tent, or look for an event staff member. We have a zero tolerance policy towards any violence on and around the festival area. You can bring meds if those are in their original packages and unopened. In case obeying these terms do not appear, we have the right to throw those pills away. Please make smart choices. We do take all the common credit and debit cards which are preferable. You can always bring cash – just in case! We will have selected areas that will accept cash. Please note that the closest ATM is outside the festival area! All found items will be held at the festival on site INFO booth during the festival hours. After the festival all items will be sent to the Police Lost & Found Service. If you find something that is not yours, be kind and do good and return it to INFO booth as well.